A health board has agreed to remove a leaflet which could have led to unlawful data-sharing following the Named Person Supreme Court judgment. 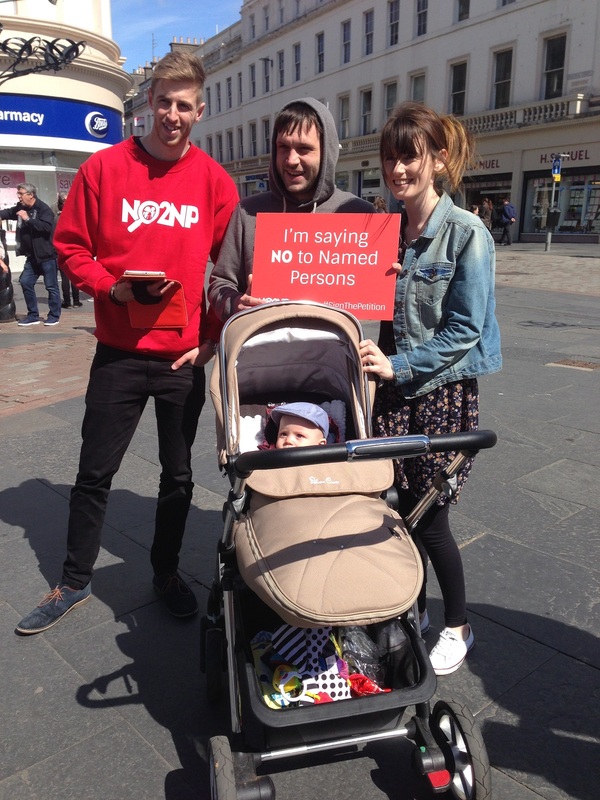 The leaflet was spotted by a parent who contacted NO2NP stalwart Lesley Scott of Tymes Trust. 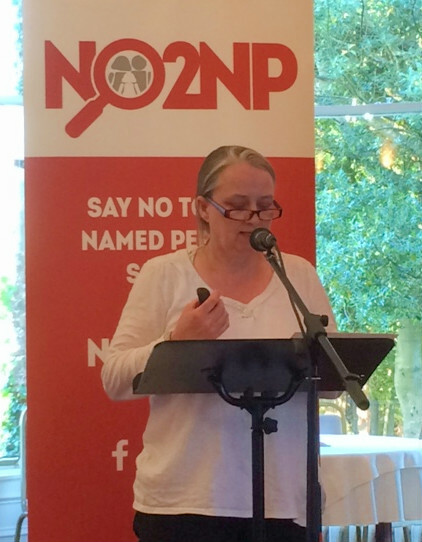 She wrote to NHS Tayside to ask for the leaflet to be withdrawn. Parents were being handed the leaflet at Accident and Emergency departments in the area. When the Supreme Court judges struck down the data-sharing provisions at the centre of the Named Person scheme, they ruled that routine sharing of confidential information breached the right to privacy. 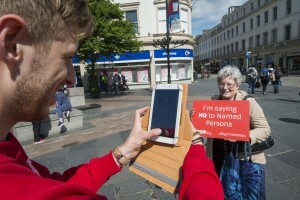 Despite encouraging routine data-sharing, the Scottish Government has denied local authorities have acted unlawfully. 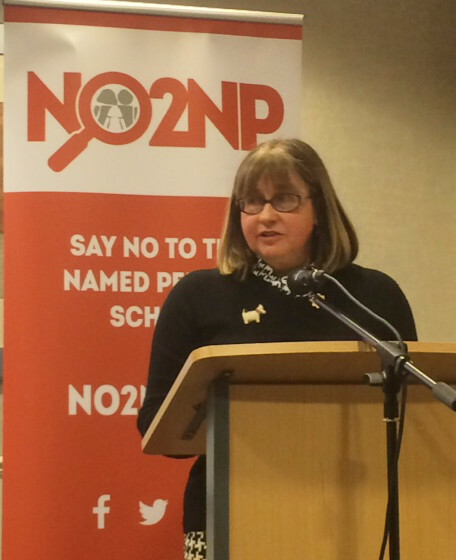 Mrs Scott has called on the Deputy First Minister to review Named Person pilot schemes. 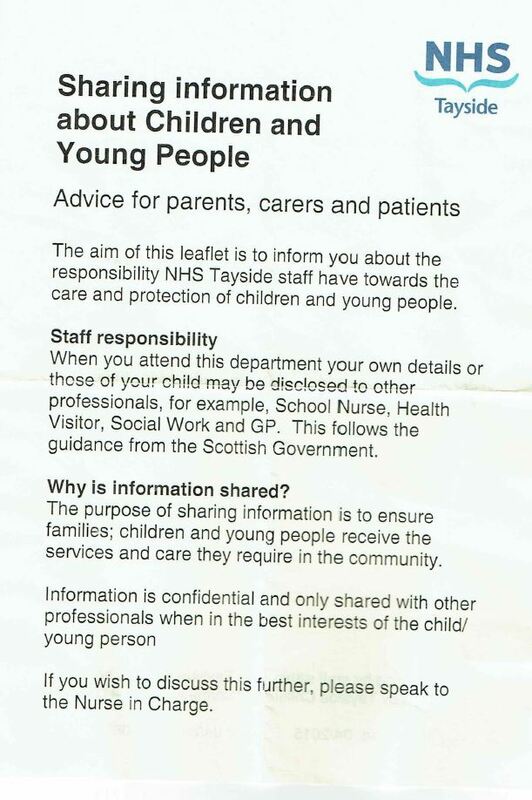 Chief Executive of NHS Tayside Lesley McLay responded to Mrs Scott’s concerns and agreed to withdraw the leaflet and review its data-sharing policy. 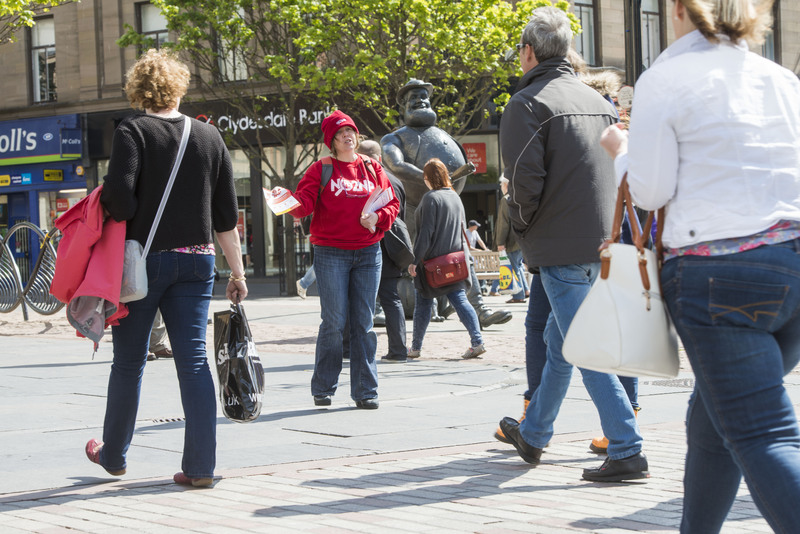 If you’re a parent be vigilant and take note of leaflets and information you are being given by those working with your children. If they don’t refer to the Data Protection Act and Human Rights Act they may be encouraging unlawful sharing of your family’s personal information. 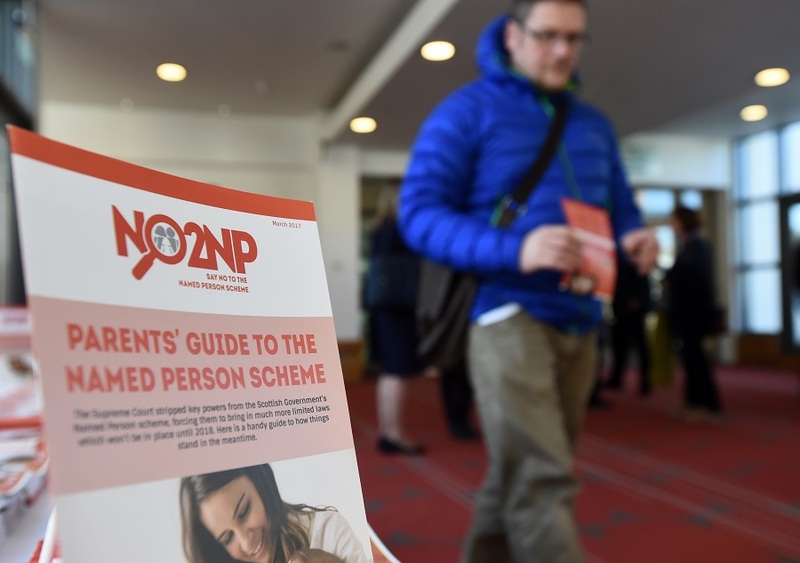 You can write to the relevant authority to ask for materials to be withdrawn or if you have questions about a leaflet, email a copy to admin@no2np.org. There was a great turnout at the Waterside Hotel, Peterhead on Monday night, as the NO2NP team rolled up to ‘The Blue Toon’ for their latest roadshow event. 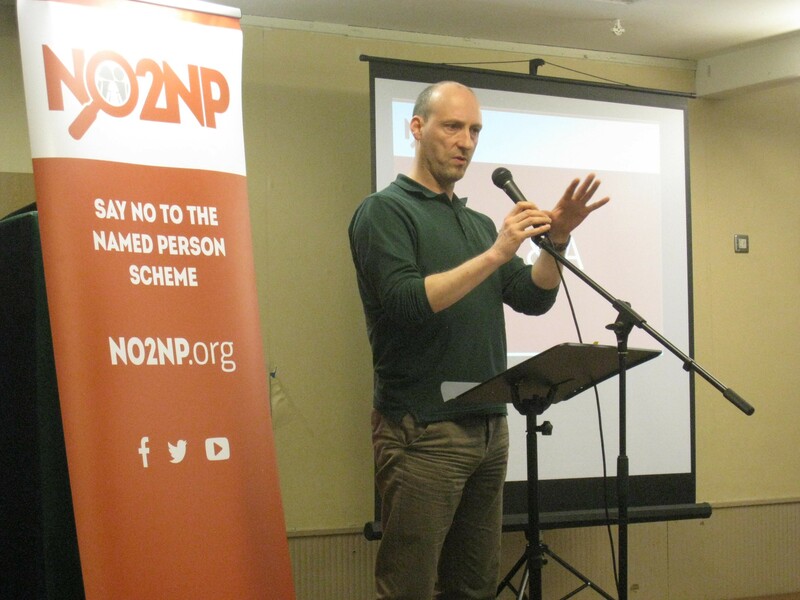 We were delighted to welcome back a senior academic to share his own troubling experience of the highly invasive Named Person scheme. The speaker, who wishes to remain anonymous, has undertaken academic research on the workings of the former USSR and he said it was “petrifying” to see the similarities between that and the Named Person scheme. He explained how at a review meeting for his youngest child, the health visitor had mentioned in passing that they had a note that his son was depressed. She said this “must have been a mistake” in the “family record”, because the youngster was really happy. 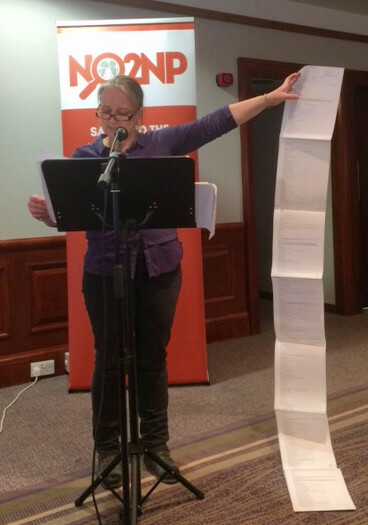 When he pressed her on what this family record was, he was told there were “daily notes”, which he found odd, as he had only met this health visitor twice. He discovered that the document was used to gather hearsay. It took some persistence before he was finally allowed to see the record and to his alarm, he found it was a heavily redacted 60-page document. He was told the parts that had been scored out were “3rd party information”, i.e. people’s opinions about his family situation. The authorities were clearly trying to make a case to intervene in his family with such routine issues as a blister on his child’s upper lip, nasal discharge and a nappy rash. The record will remain until his boys are 26. 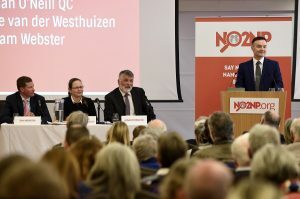 “It’s very worrisome that interested and engaged parents have no way of finding out what’s happening to their families in terms of surveillance”. 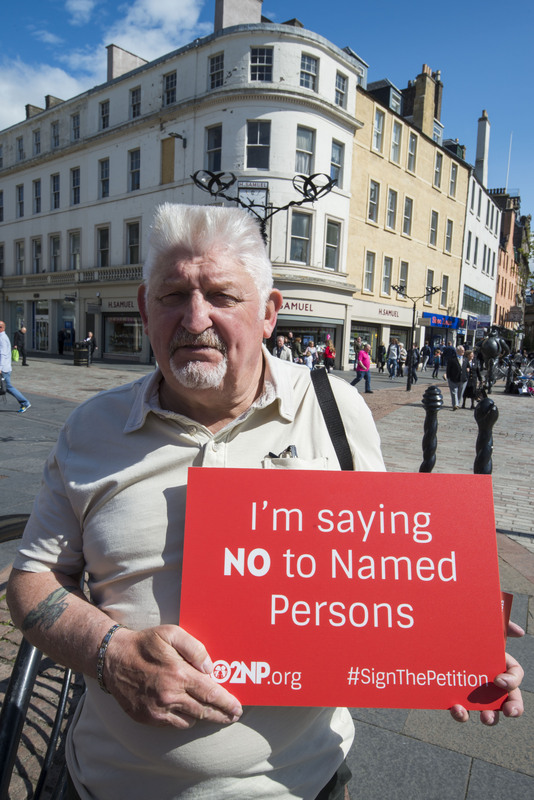 He believes many health visitors don’t always want to be Named Persons, but have to in order to protect themselves and their jobs. He said he has huge respect for health professionals, but feels their time would be better spent on other things. Despite all this, in an upbeat conclusion he said he has “great hopes” for the Supreme Court ruling and for local people standing up against this legislation. Parental capacity to provide well-being assessment: a pre-birth assessment tool used by midwives to record the prospective parents’ capacity to provide their unborn child’s right to be safe, healthy, achieving, nurtured, active, respected, responsible and included. 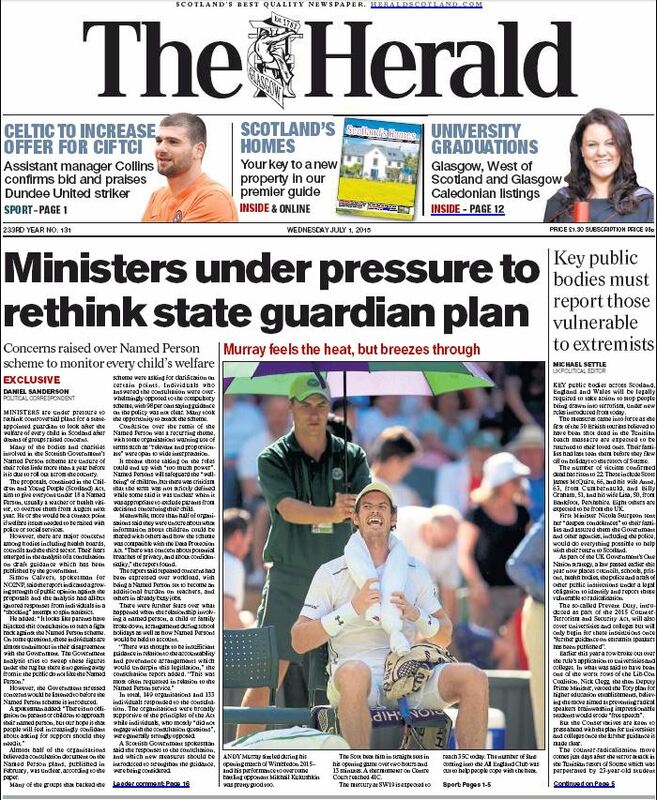 Once that concern is raised the Named Person has a legal duty to then act to assess that child’s wellbeing needs. 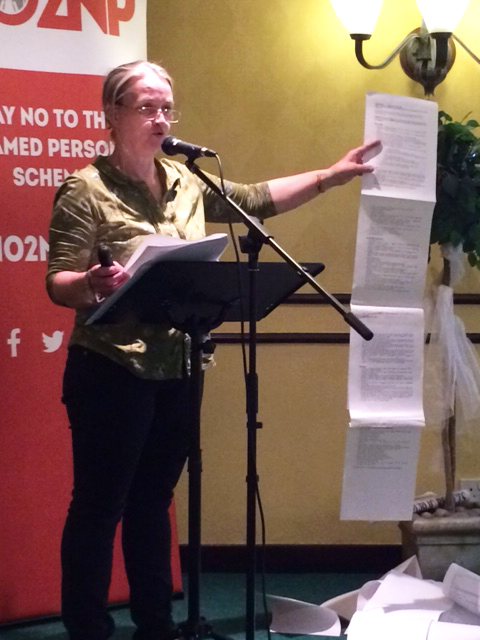 Lesley finished with the Grampian Practitioner’s Guide to Information Sharing, Confidentiality and Consent to Support Children and Young People’s Wellbeing’. 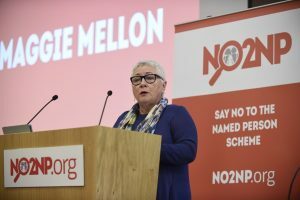 This states that the sharing of confidential information is lawful where disclosure is in the public interest; it then defines public interest as ‘protecting wellbeing’. 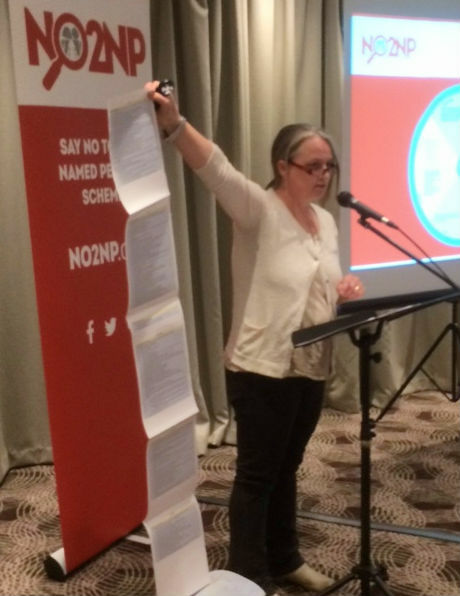 It also emphasises to practitioners that “Data protection does not prevent the sharing of information” and that they should “Record, record, record!” Is it any wonder that runny noses need 60-odd pages of ‘family record’ write-up? 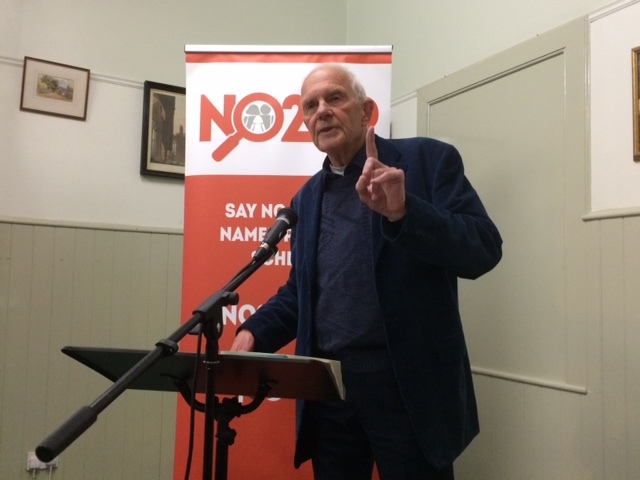 Nigel Kenny of The Christian Institute then gave an update on the judicial review at the Supreme Court, before suggesting some practical ways in which people could get involved with the campaign. 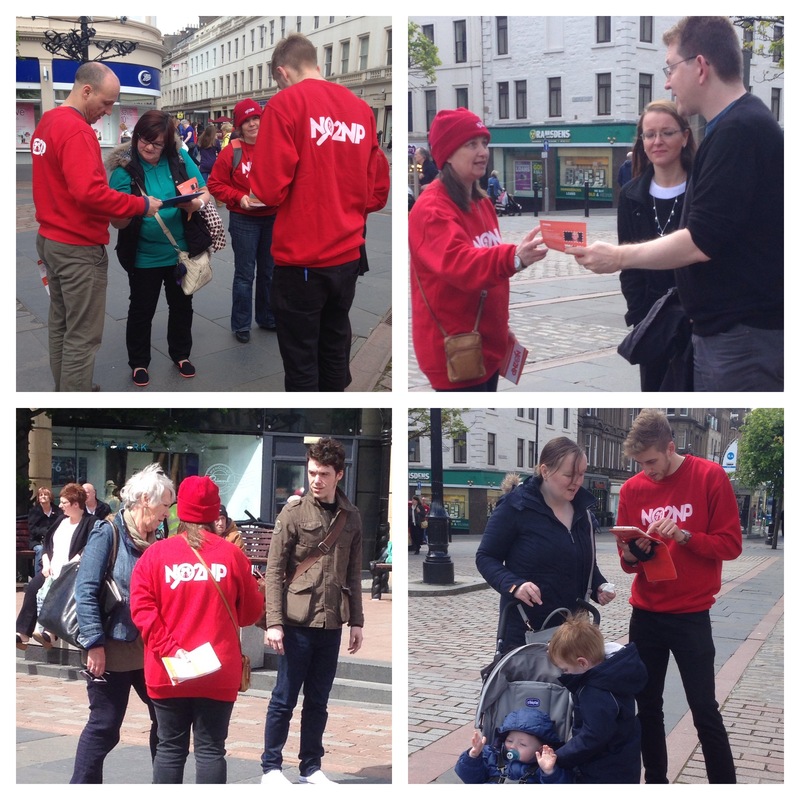 At the end a record number of people signed up to be volunteers! 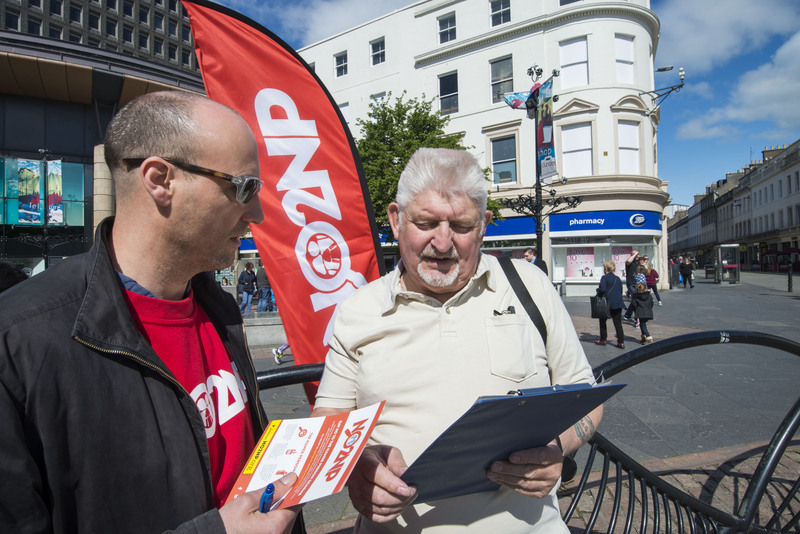 Some of them will be in Peterhead’s town centre tomorrow for our latest Action Day, so if you’re around do come and speak to them. 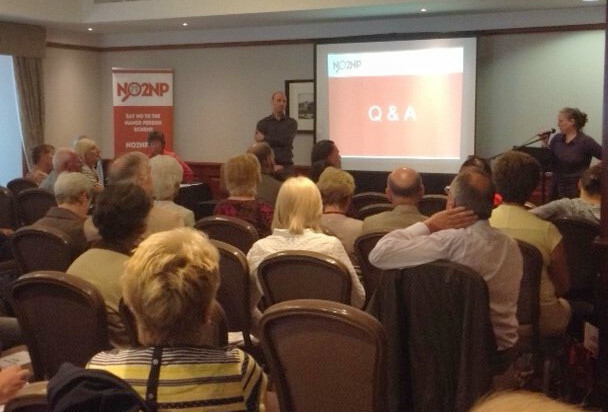 The Dean Suite of Kilmarnock’s Park Hotel was full on Wednesday night for the latest stop for the NO2NP Roadshow. 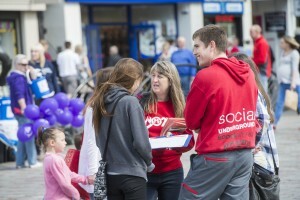 We even had a journalist and photographer from a national newspaper turn up! 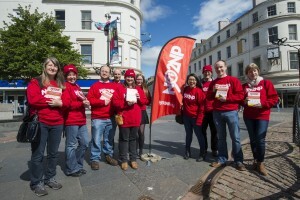 Word about our roadshow events is certainly getting around. 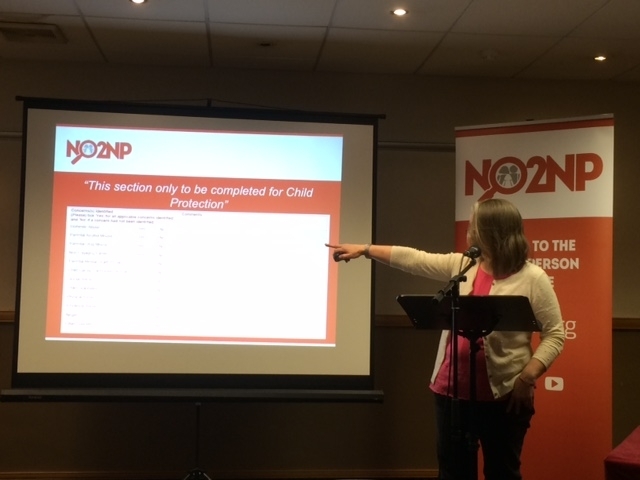 After a video was shown from last week’s Question Time in Aberdeen (where the Named Person was discussed), community paediatrician Dr Jenny Cunningham gave the first talk. She said that a child’s wellbeing (something nowhere defined in the legislation) is going to be assessed and judged, not by parents, but by health visitors, teachers and social workers. 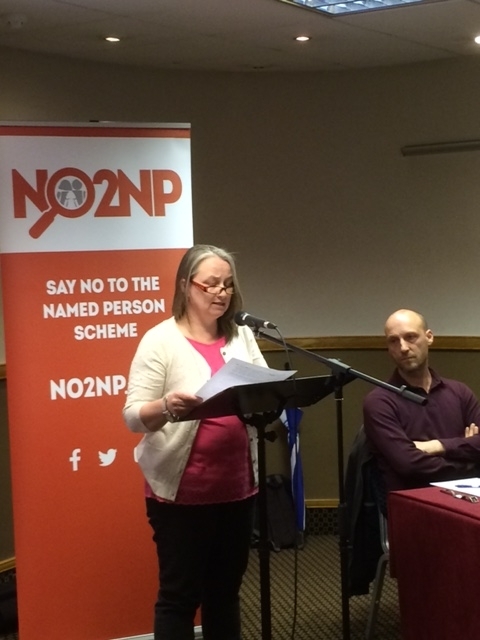 She finished by saying that the Named Person scheme “undermines, not supports, parental authority. Parenting is not some formulaic prescription of right and wrong practices: it’s all about parents’ relationship with their children”. 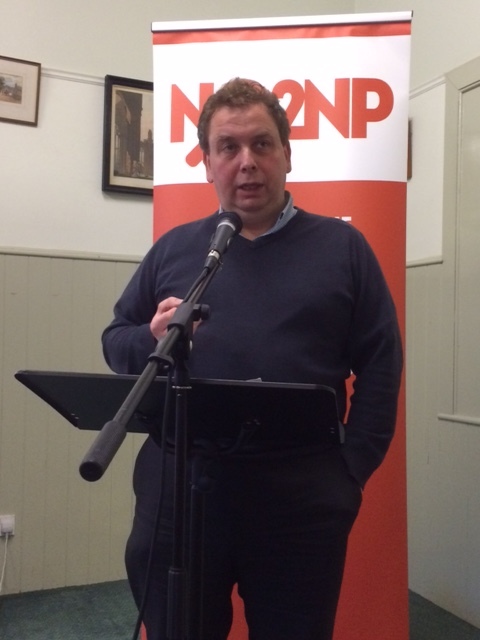 Next up was Dr Gordon Macdonald, CARE for Scotland’s Parliamentary Officer. 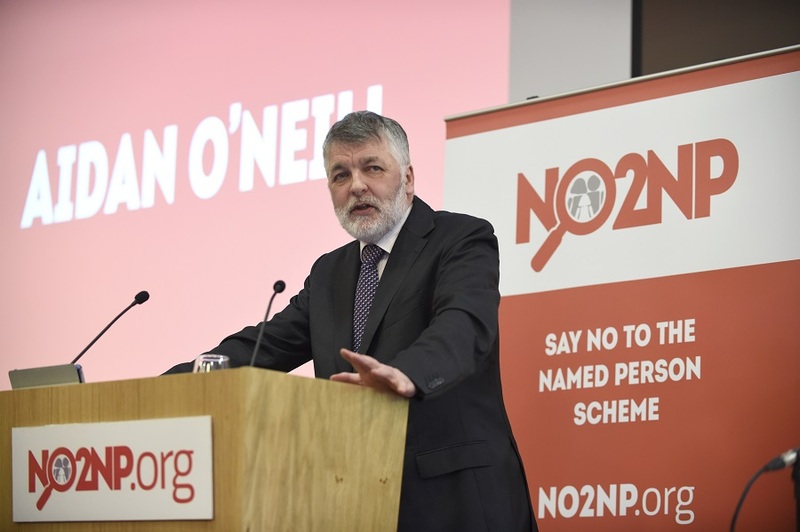 He explained the reasons behind NO2NP’s opposition to the Named Person scheme, which are really threefold. 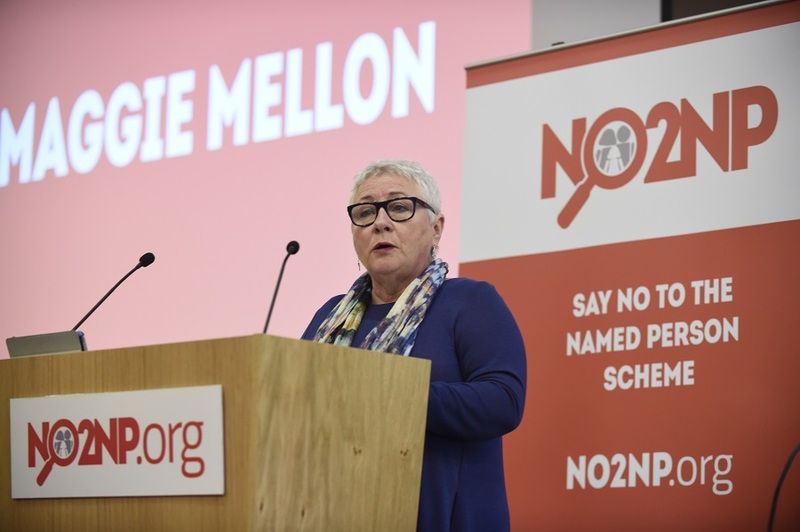 First, it’s universal in its nature – it’s not just for a few vulnerable children and there is no opt-out – and no opt-in either. Secondly, it’s about the nebulous concept of wellbeing, not welfare (which is defined in law as significant risk of harm or neglect). 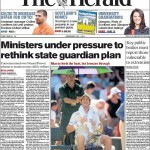 Wellbeing is much harder to define, indeed there is no definition of it in the Act. And the third reason is the widespread data sharing that will take place, for which there is no opt-out. 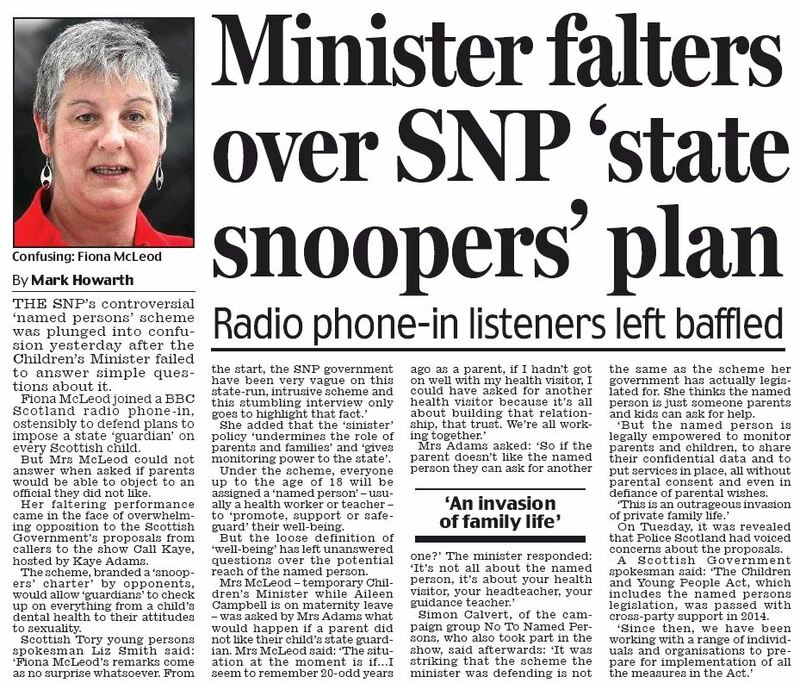 Despite Nicola Sturgeon’s assurances that the scheme is not mandatory, the data sharing aspect will be universal and compulsory, with no consent required for the sharing of personal and sensitive information. 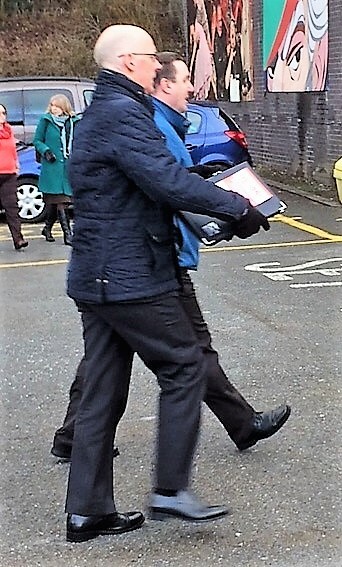 Gordon’s children’s school recently sent him a letter which said: “It is our practice to share information”, which is far removed from the legal requirement of “strict necessity” for such information sharing. If parents refuse to cooperate, then that itself becomes problematic. Gordon went on to say that the ideology behind the scheme is that children’s groups see children as being fully autonomous, when in fact they are not. 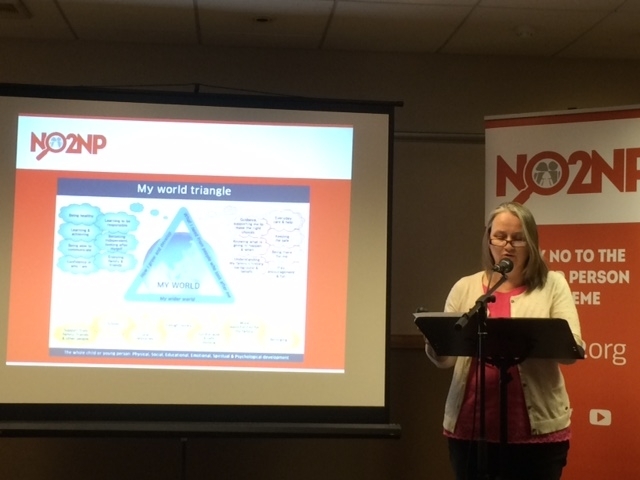 Lesley Scott from TYMES Trust then spoke about the fact that children and young people must show progress in the eight areas of wellbeing (SHANARRI) in order to be assessed as doing well now and in the future. 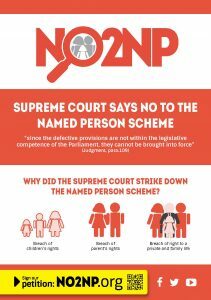 But even supporters of this scheme cannot find the words to explain the concept at the heart of the Named Person. 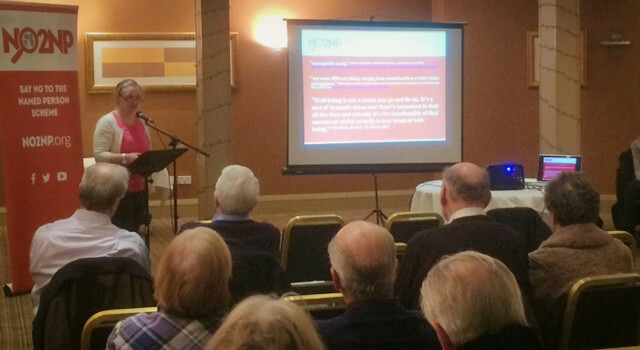 Lesley went on to say that “in East Ayrshire you are part of the AYRshare model for health and social care collaboration. 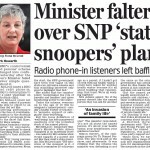 In other words, she concluded, anything and everything will be logged – and shared. 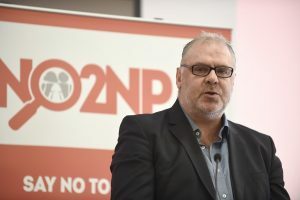 After showing a video about the history of the NO2NP campaign, Nigel Kenny suggested some ways in which people could be involved, before Dr Stuart Waiton from Abertay University hosted an extended Q&A. Several people signed up as volunteers and a local team will be in Kilmarnock’s town centre this Saturday for our latest Action Day. If you live in the area, please come and say hello to them! 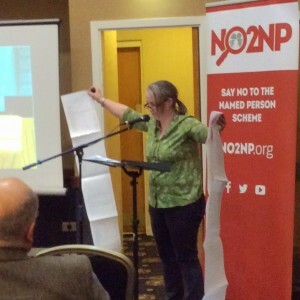 Lesley Scott, Scottish Officer for Tymes Trust and a regular NO2NP Roadshow speaker, spends a lot of her time delving deep into the chaotic detail of Government documents. 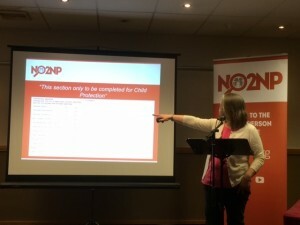 She shares some of her latest findings involving a curious change to the implementation of Named Persons and some guidance suggesting a compulsory plan for every child – not just parents who ask for it or children who are identified as vulnerable. 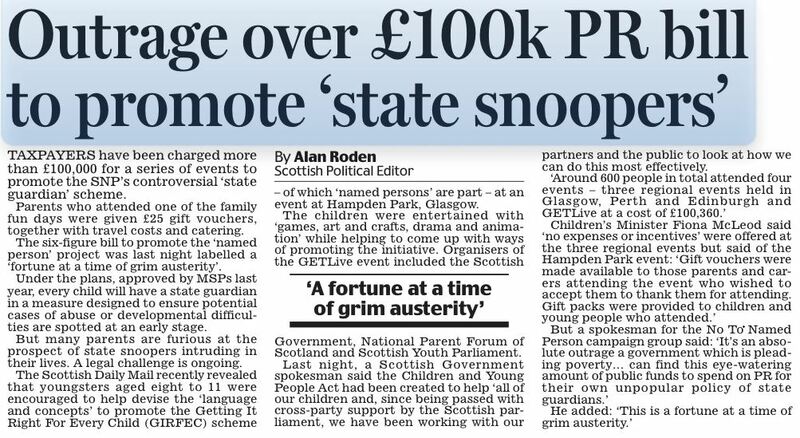 Back in December 2010 the Scottish Government produced ‘Practice Briefing 1: The role of the Named Person’. 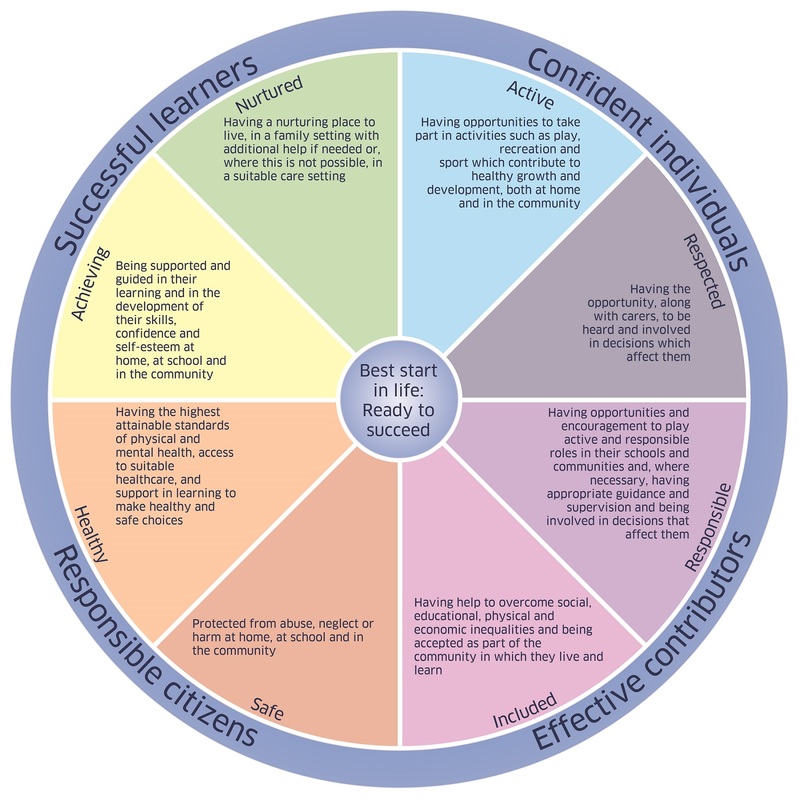 This was the first of eight Practice Briefings that were written “to help practitioners and managers put Getting it right for every child into practice in their agencies”. 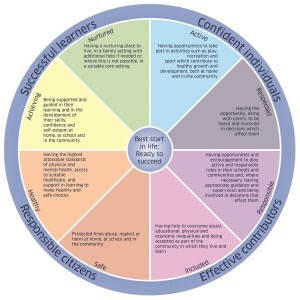 This mirrors the established practice model in the GIRFEC Pathfinder trialled in Highland which has the midwife as the Named Person until the baby is ten days old. 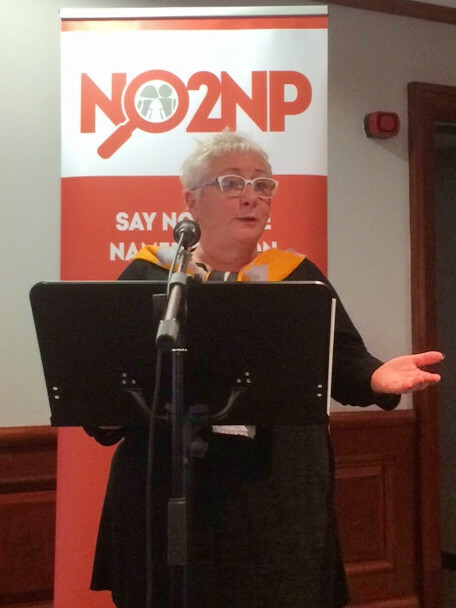 This ‘Highland Practice Model’ has formed the basis of the success claimed around the GIRFEC approach – claims which have been used to push forward this legislation. 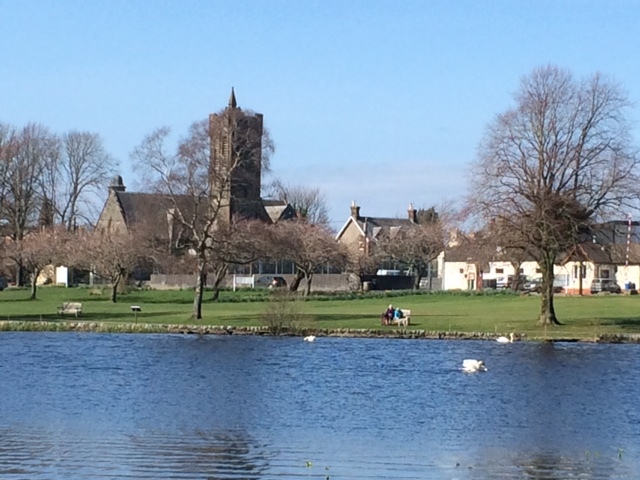 The Highland Council and NHS Highland also brought out a document in March 2015 called “Guidelines for Maternity Services Getting it Right for Every Mother and Child” that reflected this change. 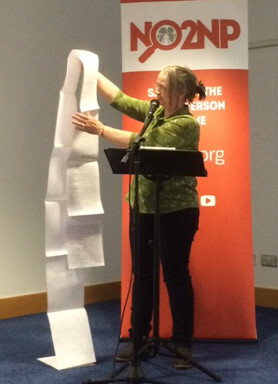 The document states: “The premise of GIRFEC is focused on the needs of a child”. It expands that, however, “within a maternity context the approach can be used as a model which provides the same principles and tools that can reflect the needs and risks to a woman and her baby.” ‘Baby’ the document clarifies, “includes an unborn baby during the antenatal and intranatal periods”. The document notes that the Highland Practice Model “requires that each child should have a plan which considers their health and wellbeing” [bold added] and that this ‘plan’ is “developed by the named person…” This would seem to contradict claims that the Named Person will only advise and support those parents/children who ask for it – rather there is a requirement for each child to have a child’s plan which means state intervention to some degree. 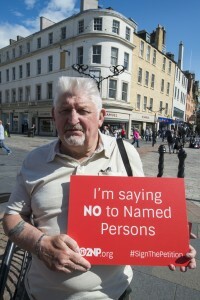 Further to that, the document then says that the “aim in Scotland … is for each pregnant woman to have a named midwife…” It then states that “the named midwife in Highland is able to undertake a named person role if required during pregnancy…” thereby seeking to draw a distinction between the ‘named midwife’ role and that of a ‘Named Person.’ Except – the document then goes into the detail of the duties of the ‘named midwife’, which look to be identical to those of a Named Person. A ‘named midwife’, the document explains, is “responsible for undertaking risk assessment at each contact and ensuring each woman follows the correct [state-approved] pathway of care” through the application of the same GIRFEC ‘tools’ as the Named Person uses. 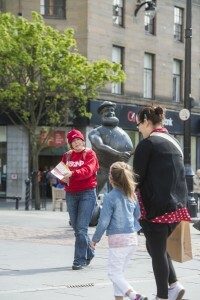 When considering if additional support is needed, the ‘named midwife’ must ask themselves the same 5 GIRFEC questions as the Named Person and “If any concerns are raised by any other agency or service that has contact with the mother, which may have the potential to affect the wellbeing of her and her baby” then they are required to share these worries with the ‘named midwife’ – just as these agencies and services are required to share any worries with the Named Person. If a wellbeing need is identified by the ‘named midwife’ through the assessment process they initiate an ‘Antenatal Plan: additional support for mother and unborn baby’ just as the Named Person initiates a ‘child’s plan’. 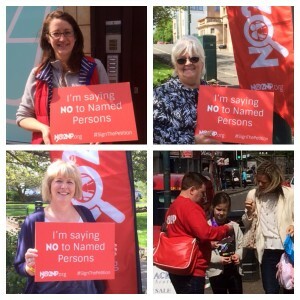 There is no difference between the duties and responsibilities of the ‘named midwife’ and those of the Named Person. Local authorities and even the Scottish Government itself still have information for families online that cites the midwife as the Named Person until the baby is ten days old. 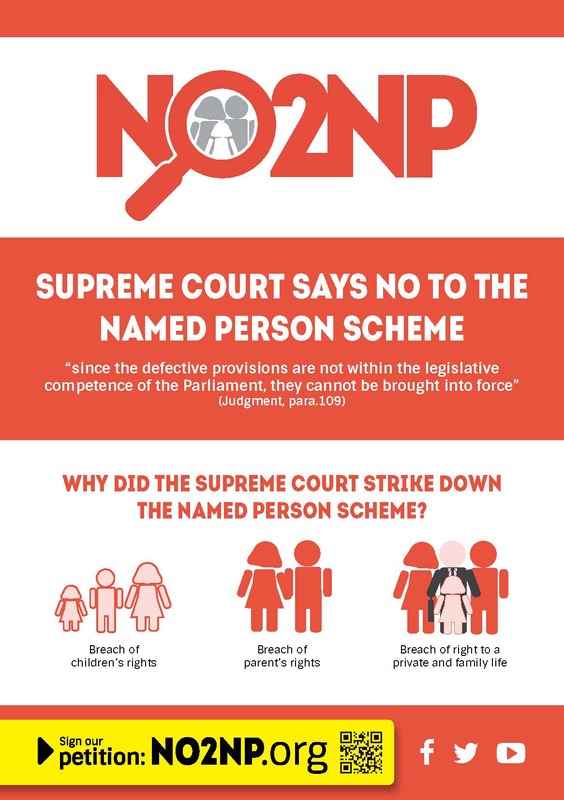 Yet the shifting sand under the Named Person legislation has moved once more; and once more, families are left to guess at the truth. 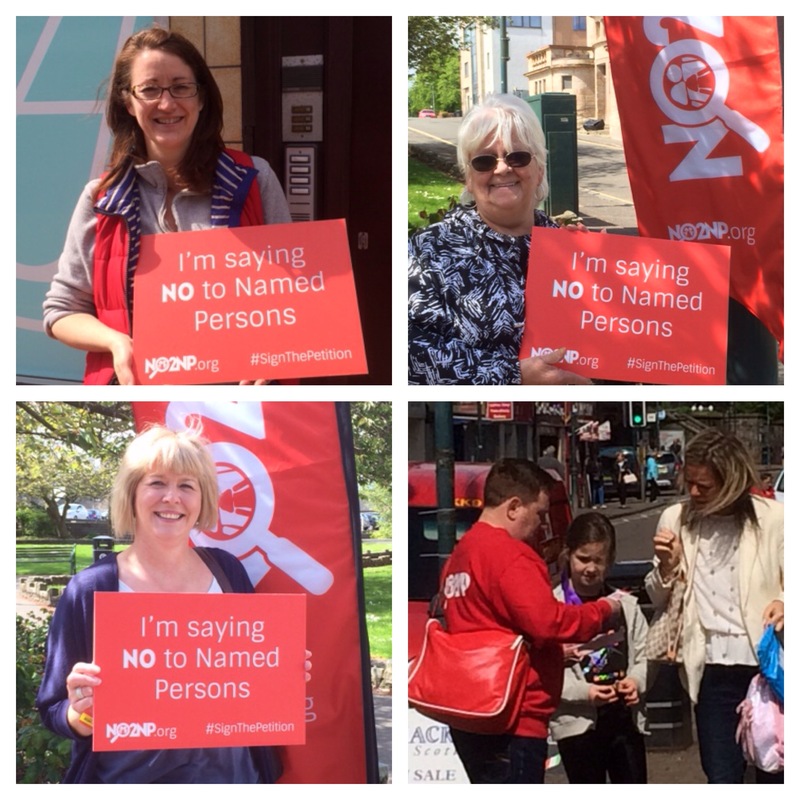 Whether they are known as ‘named midwives’ or ‘Named Persons’, they are required to be agents of the SHANARRI/GIRFEC agenda. 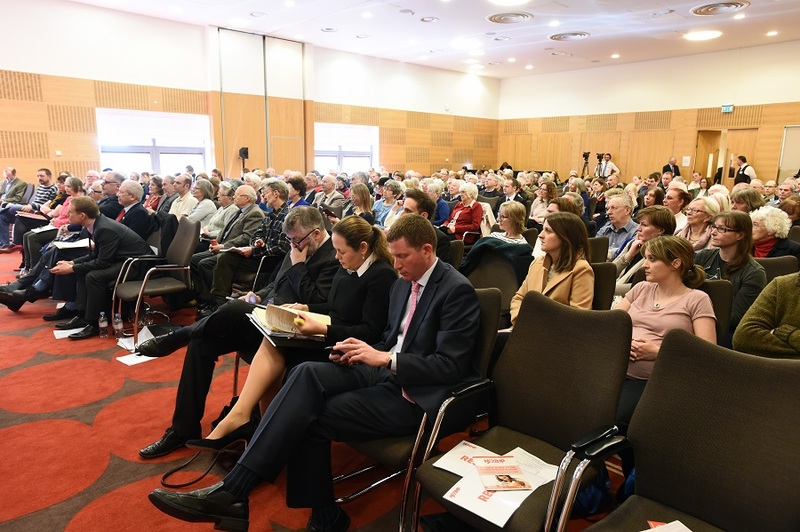 An agenda that will erode and irreparably damage the trust between families and all who undertake to perform such duties on behalf of the state. 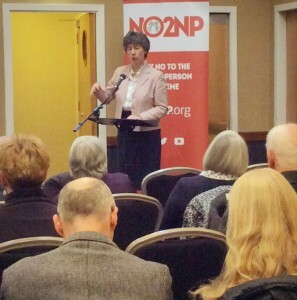 There was a packed gathering in Aberdeen on Monday night for the latest stop of the NO2NP Roadshow. 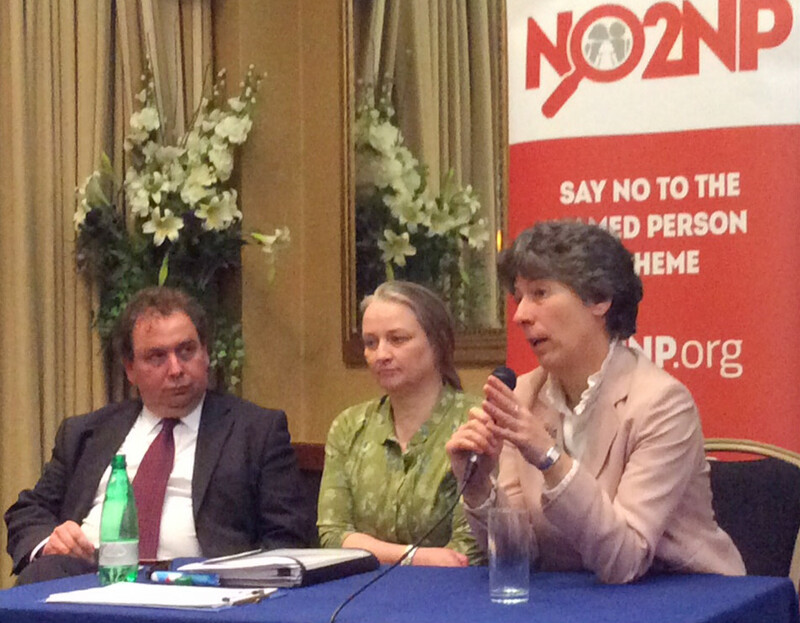 Folk from a wide range of backgrounds came to hear our panel share their concerns about the invasive Named Person scheme. 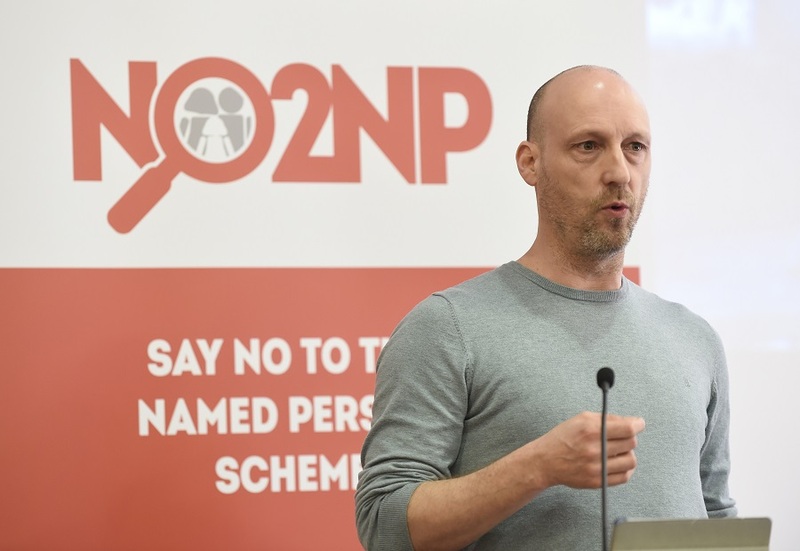 The opening speaker, an academic who wishes to remain anonymous, pointed out parallels between the desire of socialist states to control society, with the Named Person scheme and its all-encompassing influence over every aspect of family life. He said while the Named Person scheme was intended to catch the bad parents, the effect will be that everyone will actually be trapped by it. 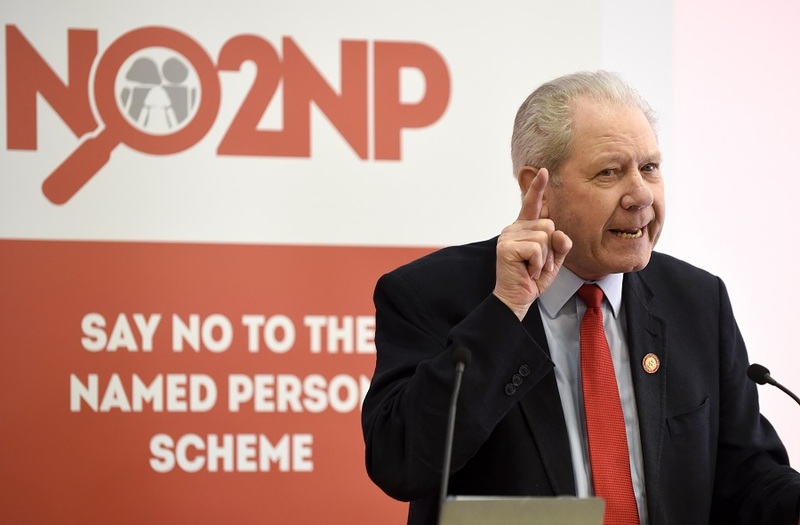 The speaker spoke movingly of his own family’s experience at the hands of proto-Named Persons who had misunderstood issues with his own children, leading him to submit a Subject Access Request under the Data Protection Act to see what had been recorded about his children. 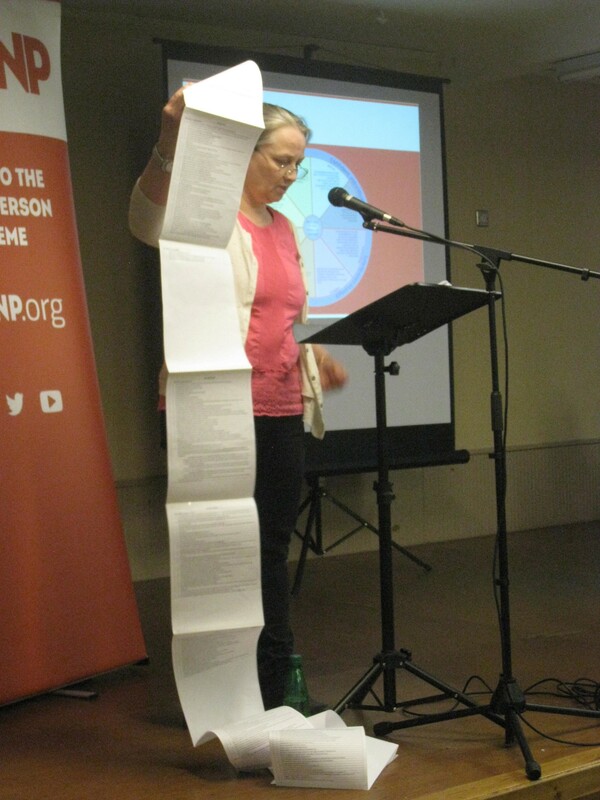 He was shocked to discover a 60-page document and even more appalled to find that huge swathes of it had been redacted – blotted out in black, because allegedly these issues did not relate to him or his children! 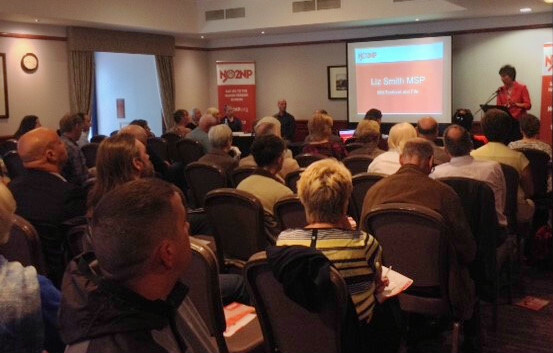 He also spoke about the weaknesses of the complaints procedure, something that the Scottish Public Service Ombudsman has recently expressed concerns about too. He found that his complaint had only resulted in the conclusion that “professionals are entitled to make professional judgments” and his only recourse now would be to go to judicial review, something his solicitor said would cost him at least £15,000! 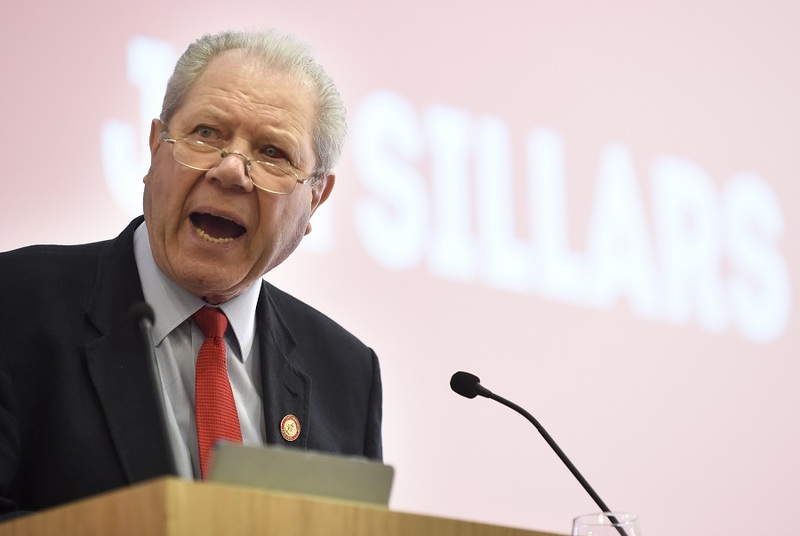 The speaker also expressed his concern for the health and teaching professionals who will be landed with this huge responsibility, with their careers on the line should anything go wrong on their watch. 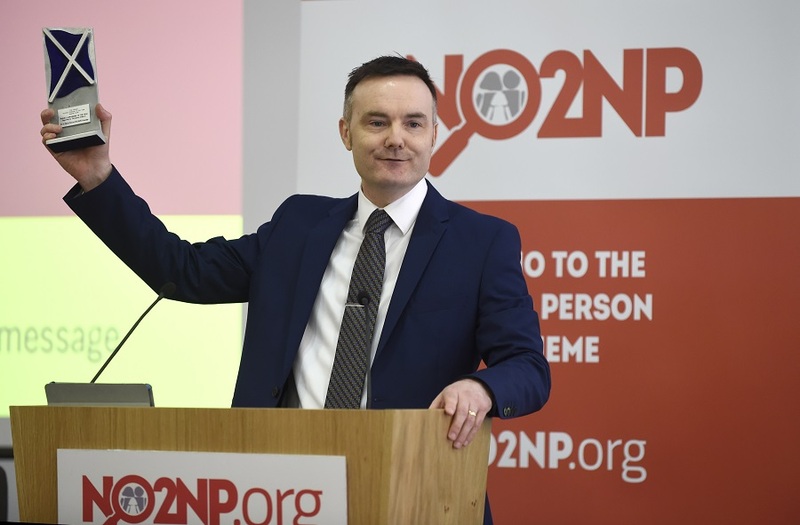 “They’re not trained to be police detectives”, he remarked, concluding that he hoped the NO2NP campaign would relieve these professionals of their anxiety by securing an end to the scheme! 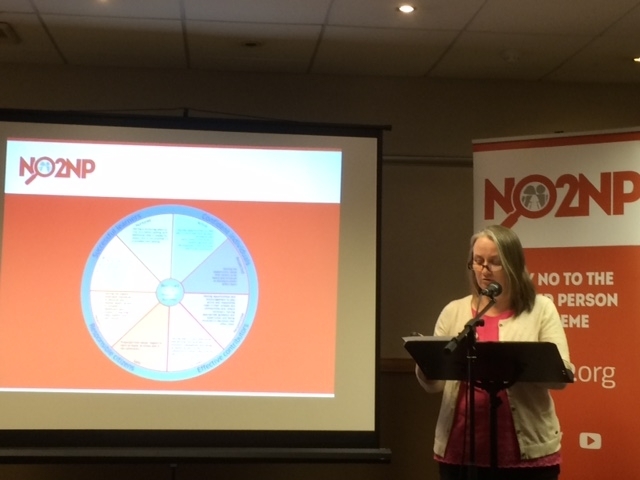 Next up was Lesley Scott from TYMES Trust, who said that the Named Person legislation had introduced an “authoritarian and illiberal scheme”, which “poses a considerable threat to family autonomy.” Lesley went on to talk about the National Practice Model, which is the GIRFEC ‘toolkit’. It is used to assess the ‘wellbeing’ of every child in Scotland and enables practitioners to investigate and assess all associated adults. However, no one is quite sure what ‘wellbeing’ really means. 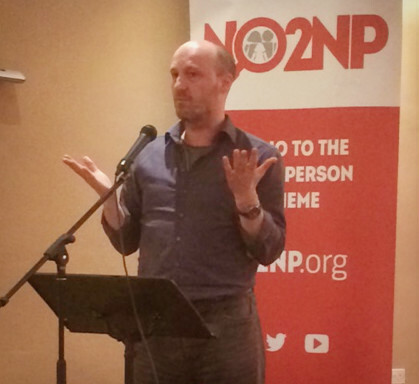 This was highlighted in a debate in the Scottish Parliament in December last year, when MSP Alex Johnstone asked SNP MSP Stewart Maxwell if he could define wellbeing. 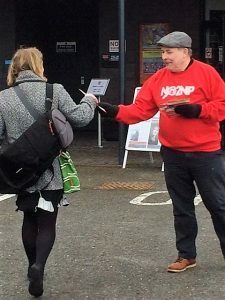 Lesley played a video of the exchange, during which Mr Maxwell berated Mr Johnstone for asking such a “ridiculous” question – yet he still wasn’t able to answer it! Alison held up a copy of the Mail on Sunday, which carried a major story in both its UK and Scottish editions about the covert psychological profiling of pupils in our schools and even nurseries. When she last looked, it had been shared 4300 times and there has been wall to wall outrage on social media. 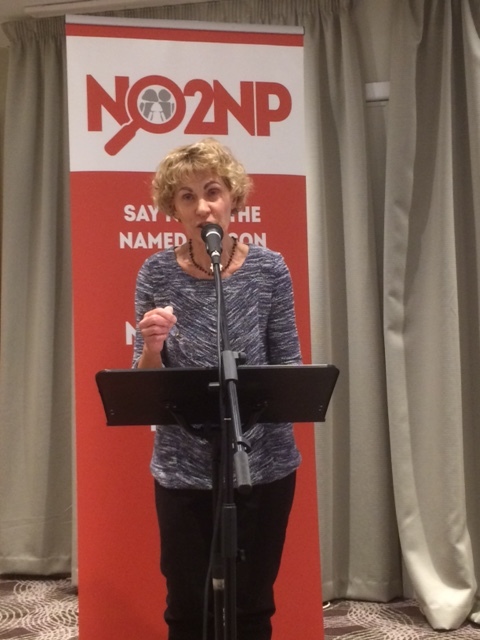 Alison concluded by telling those gathered: “You should be aware that your children’s most personal thoughts and feelings are being interrogated in classrooms in the guise of ‘resilience testing’ without your knowledge, let alone consent. Messing with young minds should not be the remit of school teachers, but has become routine with the introduction of the Curriculum for Excellence which, not very coincidentally, shares the same “well-behaving” outcomes as GIRFEC. Children are being moulded into compliant citizens who can be more easily micro-managed through life. 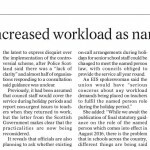 Any dissent will be quickly identified and quashed by a series of interventions to get them back on to their state approved path of ‘getting it right’-eousness”. 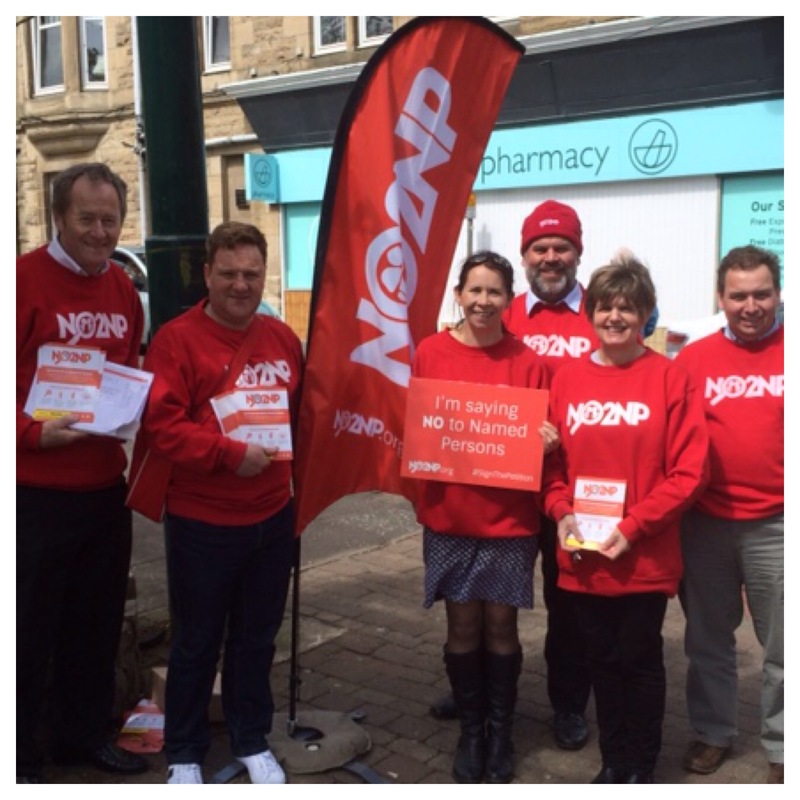 Thank you to everyone who came to the NO2NP roadshow meeting in Dingwall Town Hall last Wednesday (4 March). 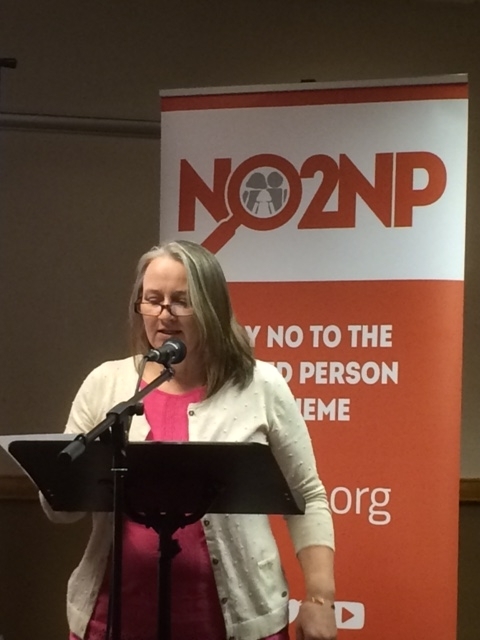 A large crowd heard Lesley Scott (Tymes Trust) explain that the named person role has expanded beyond the idea of a single point of contact and usurps the natural rights of parents. 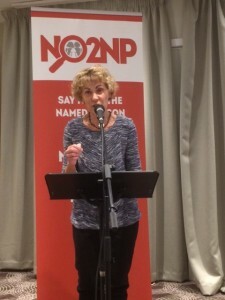 She warned that the named person has lowered the threshold for intervention based on the ‘SHANARRI’ indicators and branded the scheme as “state mandated parenting” and an oppressive intrusion into family life. 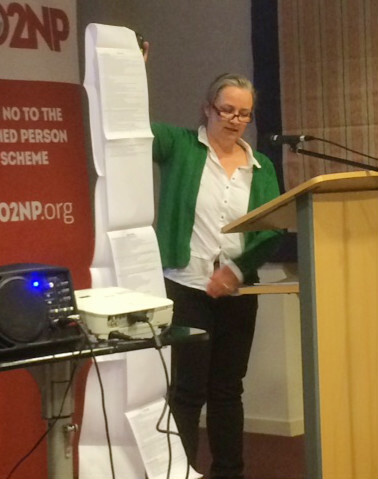 The crowd also heard from Alison Preuss (Schoolhouse) who noted that the Isle of Man abandoned a similar scheme after a melt-down in social work, She said it was a scandal that resources were being diverted into a universal scheme. On Monday 23 March the NO2NP roadshow returns to Glasgow for a meeting at the Hilton Glasgow Grosvenor Hotel in the West End where the audience will hear from Dr Stuart Waiton (Abertay Univeristy) and various others. The meeting will start at 7:30pm and is free and open to all. We hope to see you there. 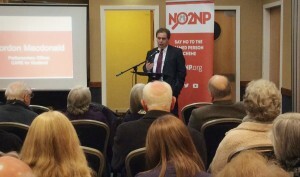 Last night (26 Feb) the NO2NP roadshow visited Cumbernauld. 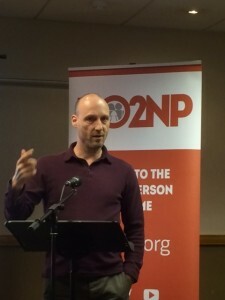 The event was chaired by Dundee-based sociologist, Dr Stuart Waiton, who spoke about the spiralling bureaucracy in health and safety. The first speaker was community paediatrician, Dr Jennifer Cunningham, who explained the ‘SHANARRI’ wellbeing indicators. She noted that vulnerability had been widened considerably, with factors such as inactivity, poor nurturing and irresponsibility being examined, rather than simply abuse or neglect. She said many parents were losing confidence in their ability to raise children. 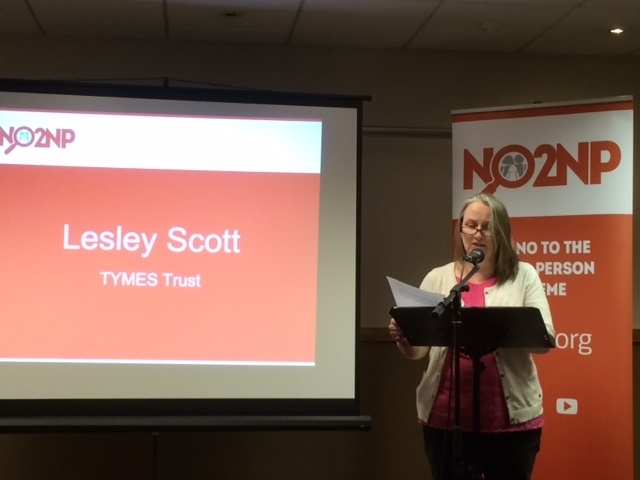 Next up was Lesley Scott of Tymes Trust, representing families of young ME sufferers. 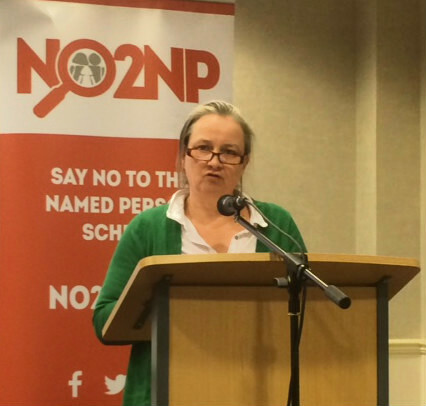 She examined the wellbeing indicators in more detail, and emphasised that there was no opt out from the named person. 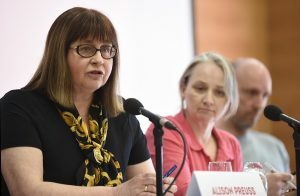 She voiced concern that non-engagement will lead to further interventions and said the scheme was state-mandated parenting. The next NO2NP roadshow will be in Dingwall Town Hall on Wednesday 4th March at 7:30pm. 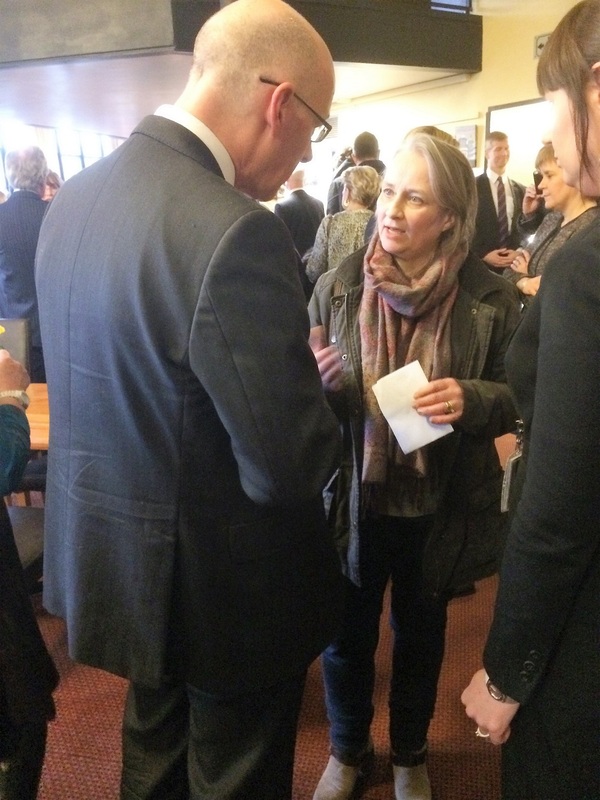 Speakers will include Alison Preuss of Schoolhouse and Lesley Scott. Hope to see you there – all are very welcome. Dr Stuart Waiton (Abertay University) was in the chair for a very well attended NO2NP roadshow at the Carnegie Conference Centre, Dunfermline on Wednesday 11 February. Dr Waiton reiterated his view that child safety policy isn’t rational and that it is spiralling out of control. 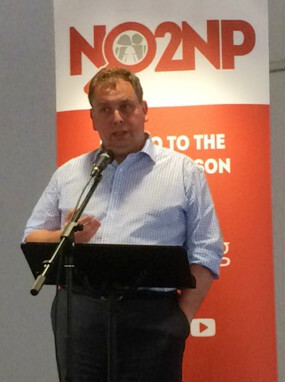 He described the potential for intervention as “astronomical”. 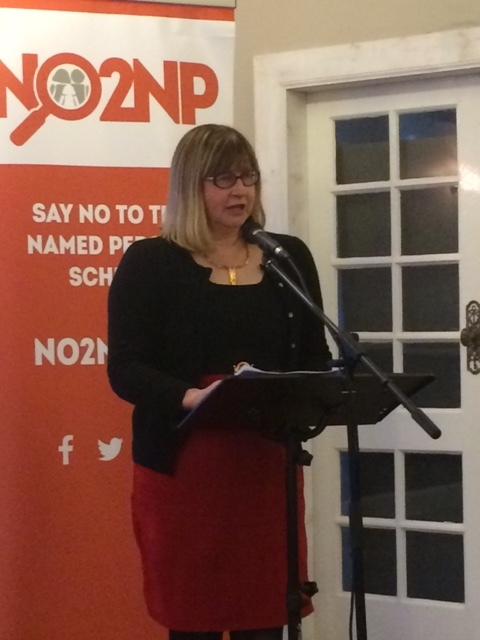 The first speaker was prominent NO2NP supporter, Liz Smith, who is an MSP for Mid Scotland & Fife. 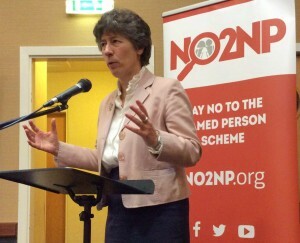 She explained her two fundamental objections to the named person scheme. First, the lack of trust in families and the fact that parents don’t want someone to tell them what to do. 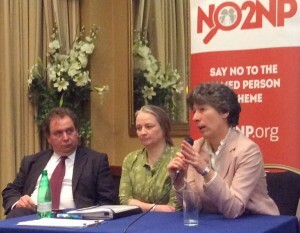 Second, that the focus of resources must be the vulnerable children who need help, not a universal service. 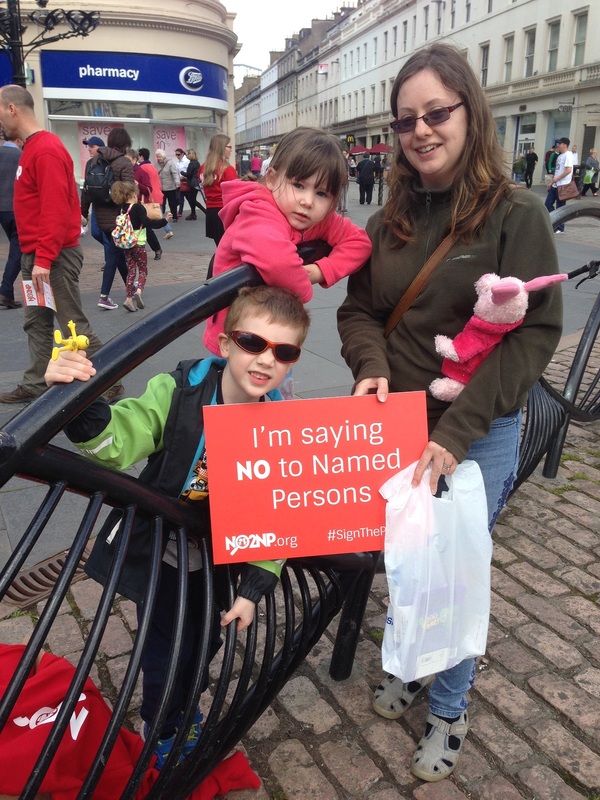 She said that the legislation is “wrong” and the named person scheme is “unworkable”. 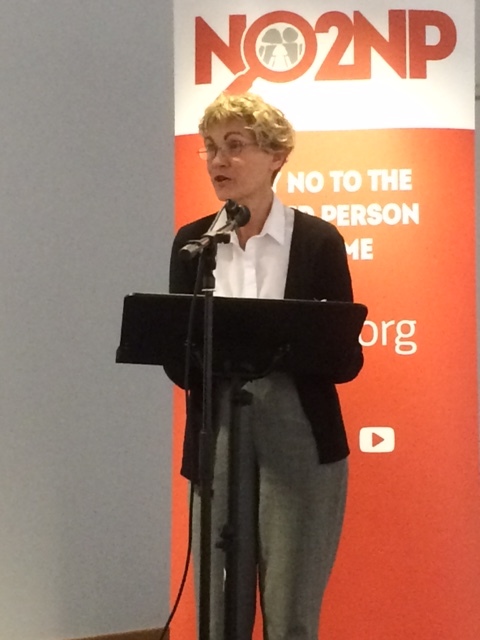 Next up was Lesley Scott, spokesperson for Tymes (Young ME sufferers) Trust – one of the organisations behind the recent judicial review of the legislation. She noted that the named person scheme is universal with no opt-out. 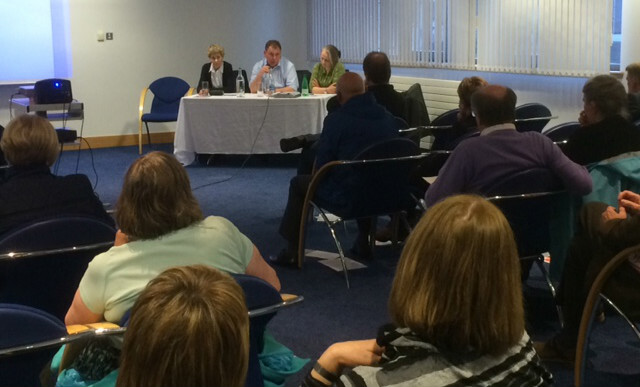 The next NO2NP roadshow takes place in CUMBERNAULD (Westerwood Hotel) on Thursday 26 February at 7:30pm. 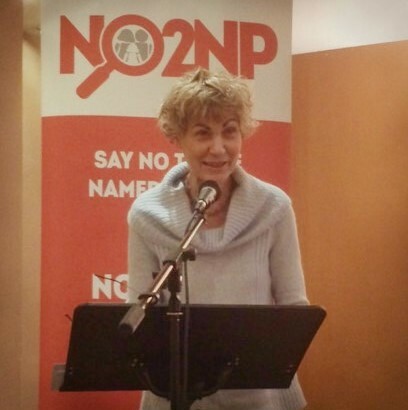 Speakers will include community paediatrician Dr Jenny Cunningham and Lesley Scott of Tymes Trust. 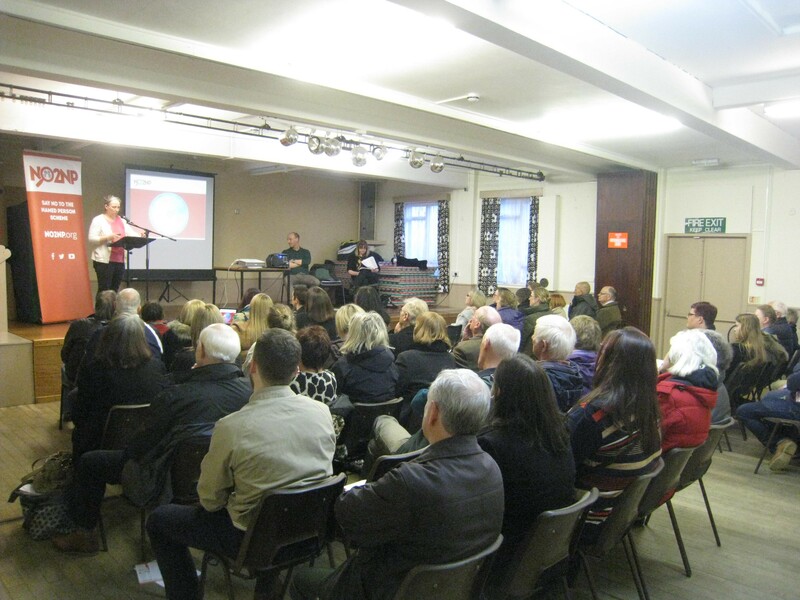 Many thanks to all who attended the latest and well-attended NO2NP roadshow in Greenock last Thursday (5 February), which was the second of six meetings already planned for this year. 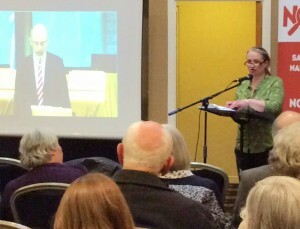 The main speaker was Lesley Scott of Tymes (Young ME Sufferers) Trust. Lesley cited fears that non-engagement with the named person scheme could lead to further intervention and child protection action. She explained that the scheme puts the authority of the state ahead of parents and families, and said that the intervention threshold has been lowered. 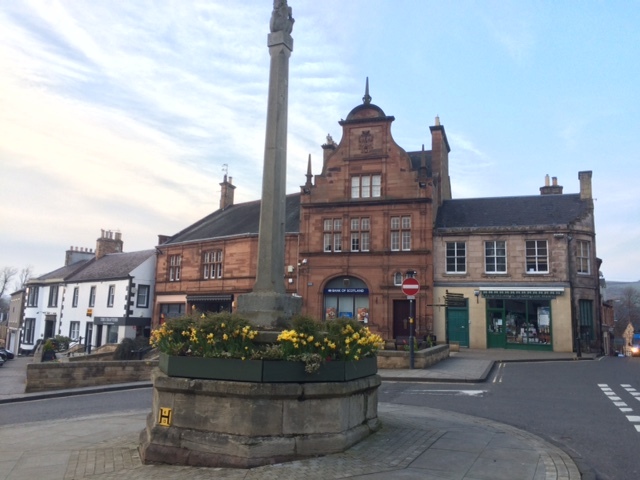 The next stop for the roadshow is the Carnegie Conference Centre in Dunfermline this coming Wednesday (11 Feb) at 7:30pm. 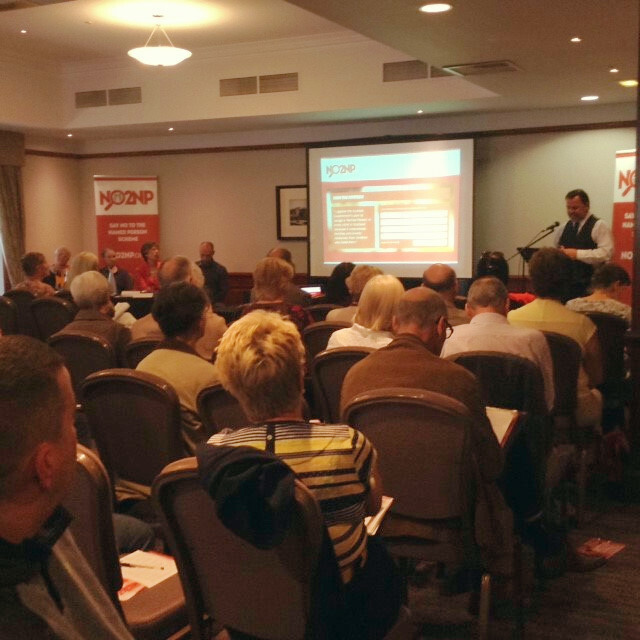 Speakers will include Dr Stuart Waiton (Abertay University) and Liz Smith MSP (Mid Scotland and Fife).We hope to see you there. 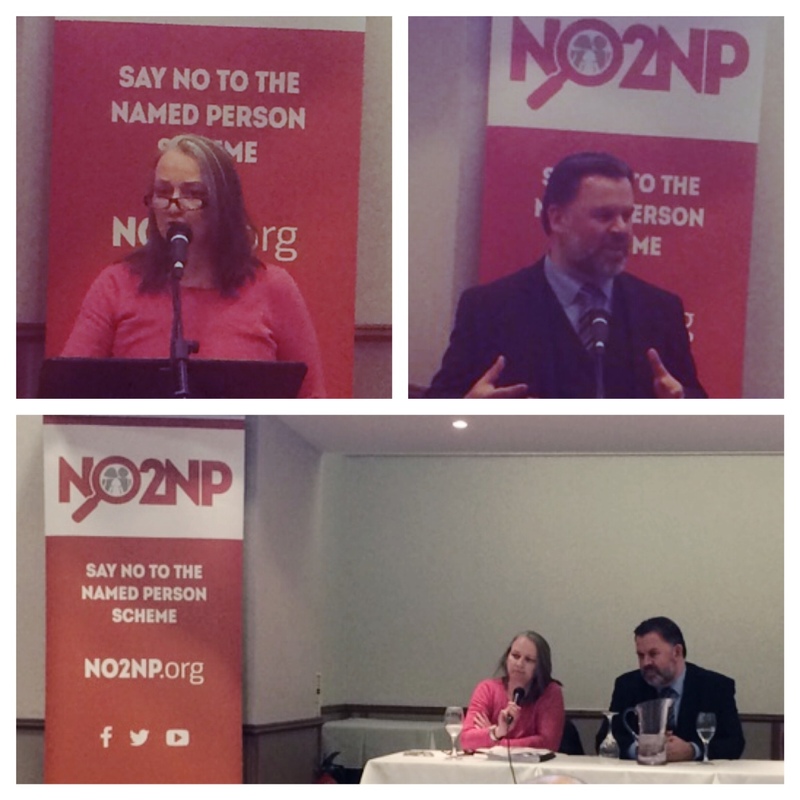 Last night (12th November) the NO2NP roadshow visited Perth, which was the seventh meeting since the roadshow kicked off back in August. 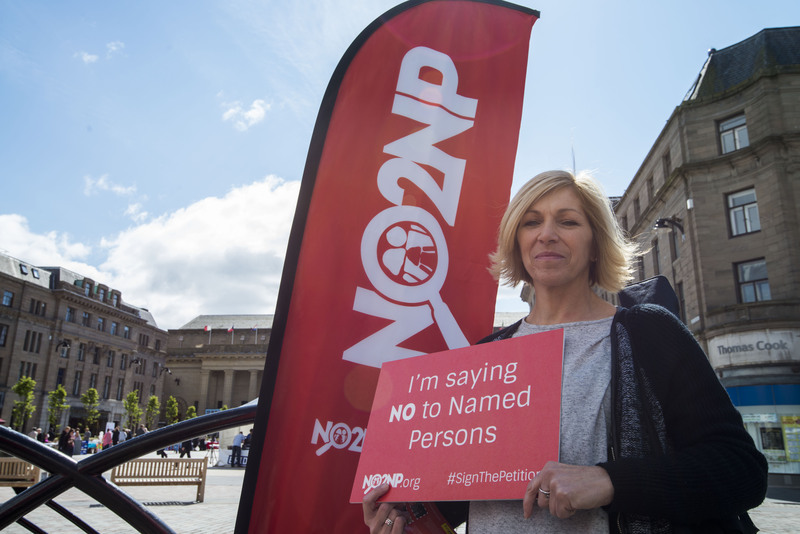 The meeting also coincided with the ongoing judicial review of the named person legislation, taking place this week at the Court of Session in Edinburgh. 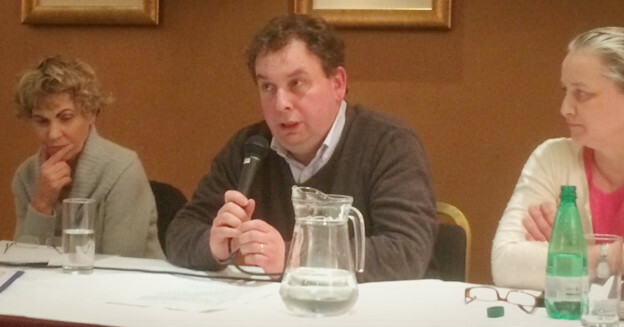 The main speaker was Dr Stuart Waiton of Abertay University. Dr Waiton spoke about how the idea that children are vulnerable and “at risk” has escalated in recent years and that there is an expectation that parents need guidance and support. 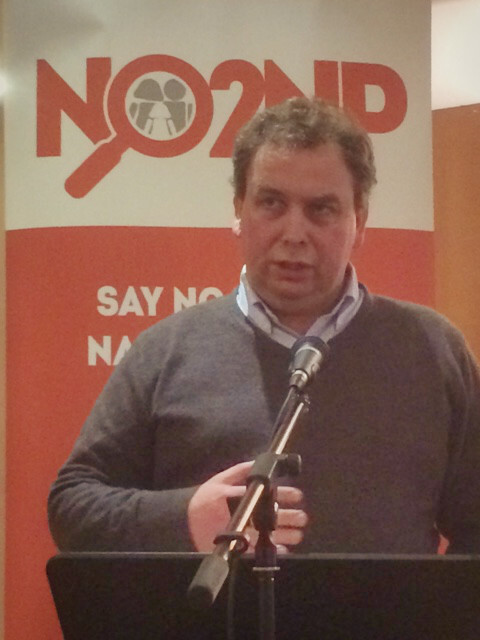 He argued that there is very little recognition of the importance of privacy and that families have become increasingly “invisible” in social policy and law, with the term not being mentioned at all in the Children & Young People Act. The meeting was also addressed by Lesley Scott from Tymes Trust, who work on behalf of young people with ME. She said that the named person usurped the rights of parents and had lowered the threshold for intervention. 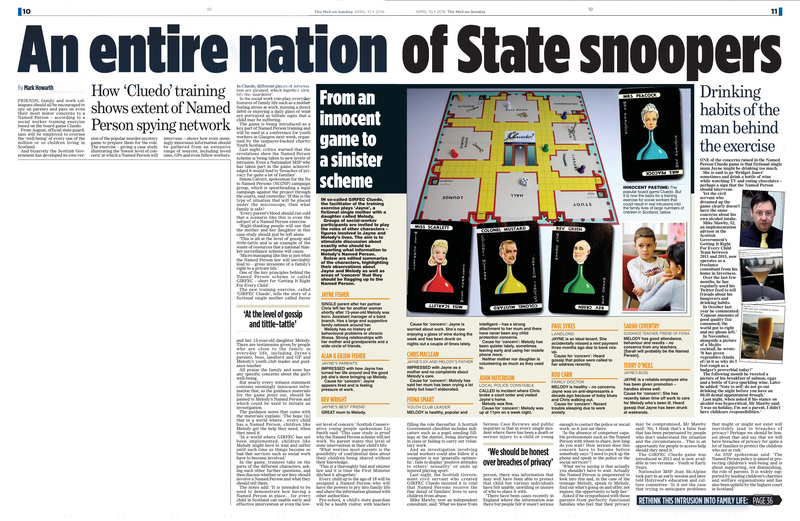 She branded the scheme “oppressive”, “illegal” and an “intrusion into family life”. 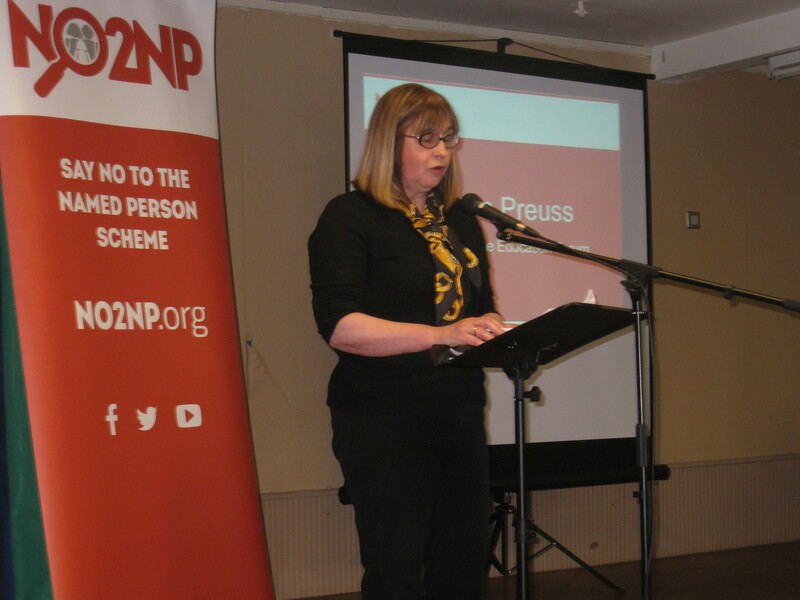 The NO2NP roadshow continues in two weeks’ time in Montrose on 26th November, where speakers will again include Lesley Scott and also Alison Preuss of Schoolhouse. More details available here.